About "Sum of the Three Angles of a Triangle Word Problems"
In this section, we are going to see how word problems on sum of the angles of a triangle can be solved step by step. In a triangle, the ratio between the first and second angle is 1 : 2 and the third angle is 72. Find the first and second angle of the triangle. The ratio of the first angle and second angle is 1 : 2. Hence, the first angle is 36° and the second angle is 72°. In a triangle, if the second angle is 3 times the sum of the first angle and 3 and the third angle is the sum of 2 times the first angle and 3, find the three angles of the triangle. Hence, the three angles of a triangle are 28°, 93° and 59°. In a right triangle, apart from the right angle, the other two angles are x + 1 and 2x + 5. find the angles of the triangle. Hence, the three angles of a triangle are 90°, 29° and 61°. In a triangle, if the second angle is 2 times the first angle and the third angle is 3 times the first angle, find the angles of the triangle. Hence, the three angles of a triangle are 30°, 60° and 90°. If 3 consecutive positive integers be the angles of a triangle, then find the three angles of the triangle. Hence, the three angles of a triangle are 59°, 60° and 61°. In a triangle, If the second angle is 20% more than the first angle and the third angle is 20% less than the first angle, then find the three angles of the triangle. Hence, the three angles of a triangle are 60°, 72° and 48°. If the angles of a triangle are in the ratio 2 : 7 : 11, then find the angles. The angles of the triangle are in the ratio 2 : 7 : 11. 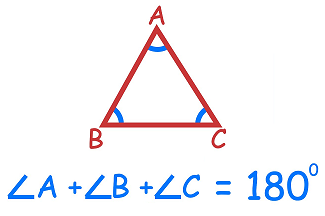 Hence the angles of the triangle are 18°, 63° and 99°. After having gone through the stuff given above, we hope that the students would have understood "Sum of the angles of a triangle word problems". Apart from the stuff given above, if you want to know more about "Sum of the angles of a triangle word problems", please click here.